Riders at JAC can request rides with Uber when leaving the airport. Learn how to receive these trip requests and get in on the action. Per JAC regulations, driver-partners must adhere to the terms below. Failure to do so may result in the receipt of a citation or even restriction of access to airport trips. Please note that Uber will not pay for any citations that driver-partners may incur. We’ve instituted a special first vehicle in is the first one out (FIFO) system at Jackson Hole Airport. The FIFO system only works within the designated, geofenced area and driver-partners waiting elsewhere will not receive trip requests through the Uber driver app. 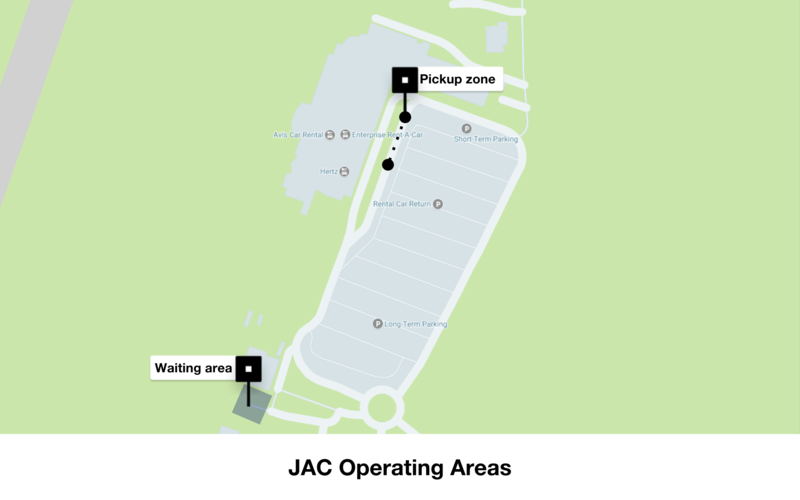 At JAC, Uber’s technology uses a first-in-first-out (FIFO) queue. This means that, in order to receive a trip request, you need to enter the designated waiting area, located within a “FIFO zone”. You will then be placed in a virtual queue where the first driver-partner to enter will be the first to receive a trip request. Based on the operating agreement with JAC, the waiting area is located next to “Hangar 1” and the administration parking area (see map below). Once you accept a trip request, the pickup location at JAC is located on the first island on the commercial lane (see map below). Based on the operating agreement with JAC, riders can be dropped off at the curb in front of the terminal. If you’d like to receive a trip request afterwards, you’ll need to keep the Uber driver app on to maintain your place in the FIFO queue.